I’ve visited Kota Kinabalu so many times ever since I became food editor for Breeze magazine: A lifestyle magazine based in Kota Kinabalu. I had the opportunity to sample many food delights with the help of many great friends I made along the way in this wonderful city. I’ve visited KK so much that every time I visited KK – they went – ooo you’re back ~~ as if I’m actually from this city itself – which I don’t mind of course – I simply love Kota Kinabalu! I guess it’s about time I write a good compilation of the best Kota Kinabalu restaurants especially for tourists. 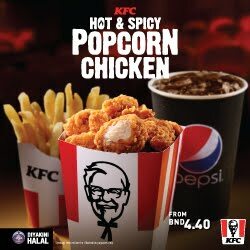 Eventhough many Sabahans would say that KK restaurants are pretty much scattered around and you do need someone to drive you around to try them out but the good news is – there’s plenty of great KK eateries that are highly rated or even the best – simply within walking distance from Centre Point Sabah. 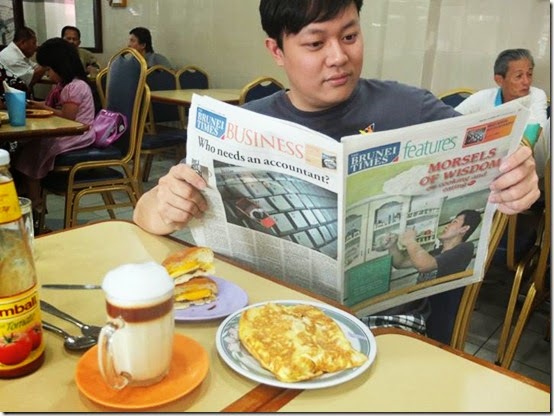 Yes – best Kota Kinabalu food within walking distance! This post will be updated from time to time if I come across a new gem ~~so here’s my list of best KK restaurants or must try food in Kota Kinabalu, within walking distance! This is my all time favourite dish of Seng Hing – their huang jiu tuaran mee. Tuaran mee on it’s own is already pretty good – but the addition of Huang Jiu (yellow wine), home made by the restaurant and stir fried together gives a fragrant sweet rice wine taste to the noodles! OMG – heavenly! I usually order mine with their signature crispy fish slices for my Tuaran mee. 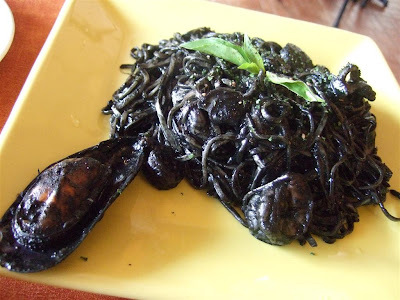 If you had not tried this dish while you were in KK, you’re missing out! They are serve delicious Tom Yum Noodles – so be sure to try that as well! Less than 5 minutes walk. 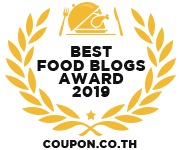 Kim Hing Lee has been around since 1982 and is featured in many newspapers – and I’m not surprised – when it comes to the best San Nguk Mian in KK – this restaurant get’s my vote. San Nyuk Mian is different from the Kuching version of ‘Cheng’ Noodles. The soup base is usually saltier, greasy and stronger in flavour. What’s special and delicious about San Nguk Mian is how thinly sliced the pork are and are so tender to the point that you don’t have to chew much ~~It’s also very near to Seng Hing Kopitiam – about less than 5 minutes from hotel as well. Who would had thought that a food court can have such yummy laksa from Melaka? Rich spicy gravy with a generous serving of chicken, soft boiled eggs and tau hu pok! This food court is on the same level as the popular Palm Square in Centre Point, which is just opposite Warisan Square where the hotel is – very convenient! I like to order my Malacca Laksa and a side order of fried char kueh to dip with the lovely gravy ~~ ooh yes! Who would had thought you can get delicious Roti Cobra within the same building? Roti Cobra is basically your roti paratha/murtabak/roti canai – served with a sunny side up egg (soft center yolks), vegetables with lot’s of meat and gravy. Once you try this – you’ll be hooked! Order some Teh Tarik Ping or Milo Ping to enjoy this Roti Cobra! Located near the Roti Cobra place is another hidden gem called Kung Fu Ramen - and is actually run by Muslim Chinese serving authentic Xinjiang cuisine - You simply must try their value for money hand pulled noodles (ramen or lamian). My favourite is the lamb and cumin dry fried lamian -- very nice! Kuo Man is located at Jalan Tuaran which is quite a distance from town but luckily they recently opened a branch at Warisan Square – accessible for tourists and just below my hotel. Excellent! They are even recommended by the famous Axian. You simply must try their Yee Wat (delicious fish paste shaped into balls and poached in broth) served with their noodles. Slurpy goodness! 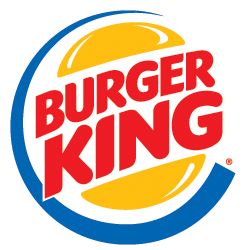 I for one – loved their beef dishes – so do try them as well! This is their Niu Muo Wang Ngau chap noodles – which is a play on the legendary Bull King Monster in the Journey to the West fairy tales. Basically it’s a mix of the delicious beef parts including my favourite beef tendon – tossed with their home made noodles. Delicious! The Sauna Steamboat concept restaurant is the first of its kind in Sabah. Making full use of the good quality seafood in Sabah, you get your food steamed and slowly their essence will be dripping down to the porridge which is actually cooking while you are enjoying your dishes one by one ~~ the grand finale is the porridge which you will eat after all your courses. Pick and choose from their live aquariums and have an enjoyable healthy meal! A good selection of seafood, meat and poultry for you to enjoy with your sauna steamboat! It is usually difficult for tourists to have a taste of local ethnic cuisine especially when they do not have a car or have no idea where to go. Thankfully Le Meridien recently introduced their discovery ala carte menu which features the local’s version of cerviche – the Hinava, raw fish marinated in lime and herbs, pickled fermented bambangan, a local wild mango and using it to cook and marinade the grilled chicken, wild ginger flower salad and a hearty indigenous style fish soup that will warm your hearts! If you visit Sabah, be sure to drop by Le Meridien Latest Recipe Restaurant for an eye opening experience! Le Meridien is just next to Warisan Square and facing Waterfront. This will be available as part of their lunch, dinner buffet or ala carte. Now you can have traditional Sabah cuisine within walking distance and in such a classy comfortable setting! How convenient! Be sure to check out their latest Fine Dining Establishment Favola for authentic Italian Cuisine! If you’re after some good quality cakes – look no further than Le Meridien’s French style cakes and eclairs. Enjoy their coffee while lounging around their newly renovated Latitude 05! Good quality French style cakes at very affordable prices! Drop by Le Meridien’s Latitude 05 after you enjoy their traditional cuisines! Yee Fung Kopitiam is another great place for breakfast – it’s a bit further – about 12-15 minutes walk but it’s worth the trip! They serve delicious laksa (different to the Malacca laksa at Centre Point) and Claypot Chicken rice. Located along the famous Gaya Street. No. 127, Jalan Gaya, Kota Kinabalu, Sabah, Malaysia. A great place for dinner - The MUST order dish is their oyster sesame sauce chicken. It looks very simple but it’s very delicious. Be prepared to eat with your hands as you munch through a mountain of these. I personally can eat 8 to 10 cuts of these wings on my own! I regard them as one of the BEST Chicken Wings in Kota Kinabalu and Malaysia. Even the famous Jalan Alor Chicken Wings pales in comparison – don’t believe me? Order and be amazed! Bah Kut Teh is a popular food for Sabahans. That delicious herbal soup coupled with that melt in your mouth pork belly – combined with lots of char kueh ~~ oh that’s heaven! Bah Kut Teh – to those who don’t know about it – is a pork based stock that is infused with Chinese Herbs or Tea to create a unique delicious herby tasting soup. It usually consists of pork ribs, sliced pork, pork belly, pork intestines and all sorts of porky goodness. Although most people would say You Kee Bah Kut Teh is the to go place for bah kut teh but in my opinion I prefer Sin Kee Bah Kut Teh 新记肉骨茶 located at Gaya Street. It is just opposite thefamous Ang’s hotell and is the same shop as Kedai Kopi Kwong Tung Chai which happens to serve good roasted duck! 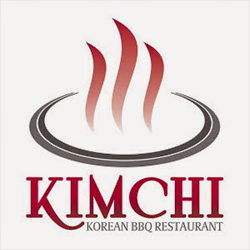 Next to Ang’s Hotel – Opens only for dinner from 5 pm onwards. Located just right next door to Sin Kee Bah Kut Teh – this bah kut teh store recently opened and has taken the KK food scene by storm! Offering dry version of rich saucy bah kut teh as well as sporting a good soup – this Da De Ku Chau Wei Bah Kut Teh is another good choice! My friend Sherina really enjoyed the food here and I’m sure you will too! CHILI VANILLA – A modern style Hungarian cuisine and other European food into the mix. The head chef is Hungarian Szilvia Pinter. They serve pretty good duck tortillas and yummy dessert choices. Cosy and suitable for dinner dates. Located along Gaya Street and near Moon Bell restaurant. The smoked duck tortilla is one of the signatures. Sliced smoked duck, with melted cheese sandwiched between toasted tortillas. Oh yes! Delicious! Give me more please! Hyatt Regency Kota Kinabalu is famous for their oxtail assam pedas, which has achieved legendary status in KK. 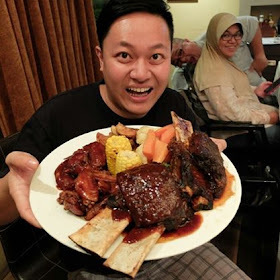 Many well known public figures and celebrities are known to enjoy this very dish and there’s even stories of former Malaysia Prime Minister DR Mahatir requesting this dish to be air flown to him! One of the places I like to chill and have drinks is at Party Play Lifestyle café which is situated along Gaya Street. The place serves fusion cuisine, mixing different cultures into their dishes, has a lovely presentation to their dishes and are quite delicious. Look out for great appetizers – fusion style pizzas and beautiful desserts! The best part is their live music performances every weekend! Come here for lunch, dinner or even supper to chill with your friends or a romantic date! Huge mocktails on gold-fish bowls! You gotta love Party Play! Next to Yamagoya Ramen – Jalan Gaya. October Café is run by a Korean man who is passionate about coffee. The one at Gaya street is actually his second branch and this is a good place for a good cup of coffee. The ambience is pretty good and they are famous for their Korean style honey toasts! Woo cafe is quite a good cafe find as they serve quite a posh selection of fancy comfort food, beautiful tarts and great coffee. Located within walking distance from Suria – they might be slightly difficult to spot as a hole in the wall cafe but the effort will be worth it. Delicious and healthy herbal fish soup is one of the specialties of this Sri Maju Restaurant in Kota Kinabalu. This place is slightly more pricey than other seafood restaurants but they are frequented by celebrities because of their fresh and delicious yet healthy steamboat fish soups! It’s located at Asia City – which is about less than 10 minutes walking distance. Healthy delicious and served with Yam Rice – this is a steam boat that you won’t forget! Be sure to call beforehand to reserve! This place get’s my vote for Cheapest, Fastest and Quality Seafood in Kota Kinabalu – within walking distance! Best seafood restaurant in Kota Kinabalu in terms of value for money and easy to find! Located at Asia City – same area as Sri Maju. They are always packed but food doesn’t take too long to arrive. Mind you – the best one is still at their original branch in Bundusan. The Asia City branch is too packed and quality can sometimes drop a bit – but it’s simply best value for money within walking distance for KK seafood! Borenos Fried Chicken prides itself as the first true Sabahan fast food that uses fresh locally sourced ingredients to ensure the freshest produce from Sabah is served to you fast food style! Their fried chicken is unique and skin is very very crispy! Did I mention that they have a really delicious chips basket and fresh tasting coleslaw! 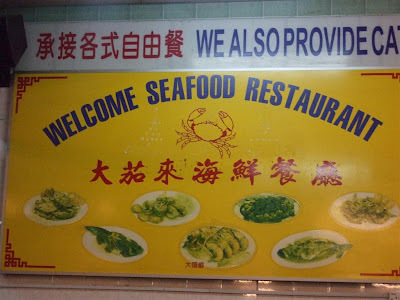 They are located very near Welcome seafood at Asiacity so do check them out! 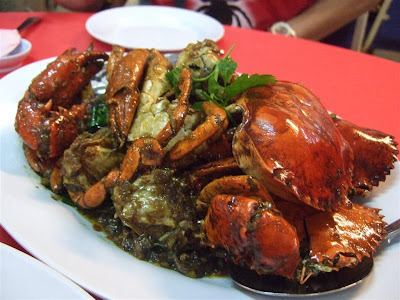 Nearby Borenos and Welcome Seafood – just right next to Cititel Express Hotel is a place where you can have Seafood Bah Kut The, which is a famous dish from Sandakan. While this might not be as good as the Sandakan version, this is a good choice in KK City. You can choose the fresh seafood available to customize your seafood bah kut teh ! I had crab, prawns, clams and squid in my mouth watering Bah Kut Teh ~~ you can also order other seafood dishes here like a regular Chinese restaurant if you got a big group! Tambayan is located around API API Centre, which is in between Marina Court Apartments and Asia City. One of the best things about this restaurant is that it opens even at 3 am in the morning! A good place to have a very sinful supper after a late night out clubbing. It’s less than 8 minutes walk from Centrepoint area – to find API API – look out for McDonalds API API. Two of my favourite Filipino dishes – Crispy Pata (fried pork knuckle) and Sisig (minced spicy pork with sunny side up egg sizzling on hot plate). They are super good especially after a late night partying or just for a simple lunch or dinner! Opens up to wee hours even at 5am in the morning! Blk 3 Ground Flr, Api-api centre, Kota Kinabalu. 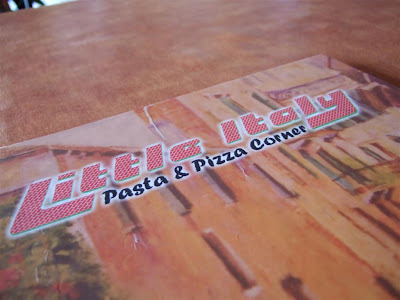 Little Italy is always packed and is located just opposite Wisma Merdeka. They are a popular place for locals and tourists to enjoy Italian food. I personally preferred Grazie – but Little Italy is more affordable and has stronger flavours to match the local taste buds. Grazie is more expensive than Little Italy but it’s my preferred destination for good Italian food. 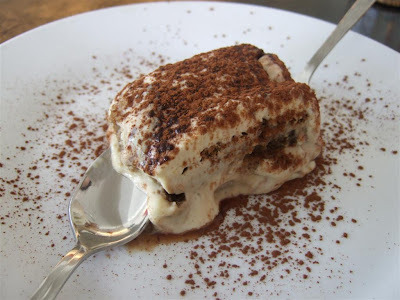 I am a fan of their tuna carpaccio and their Tiramisu is highly regarded as well. They used to be located at Wawasan Plaza but recently moved to Suria Sabah. I am a fan of their tiramisu and their delicious steaks! Mama Mia! Sri Latha is highly regarded by the locals as the go to place for good Indian cuisine. If you’re a fan of the banana leaf concept of Indian food, then you’re in for a treat. In my trips to KK, I had been recommended to try this place through different people. Some say this is the best curry house in Kota Kinabalu! The best part is – it’s just 11 minutes walk from my favourite hotel: Imperial Boutech . Below are google map directions to this delicious curry house! If you are looking for good quality authentic Japanese restaurant operated by Japanese chefs from Hokkaido – look no further than Sakagura, which is located at the ground floor of Oceanus Mall. They serve very high quality sushi and sashimi as well as good yakitori (Japanese style grilled skewers). The best part? Draft Kirin Beer! Fancy enjoying some good Japanese sushi and skewers while drinking Japanese Draft Kirin Beer! They are also facing the waterfront – so it’s a good time to have some yakitori while enjoying the sunset if you sit outside around 5:45pm onwards! Sushi Platter includes premium items like scallops and sea urchin! ITADAKIMASU!